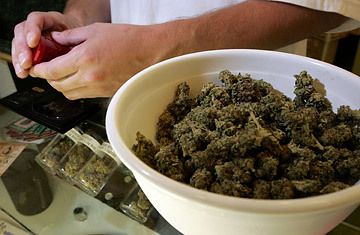 A worker at the Alternative Herbal Health Services cannabis dispensary packages medicinal marijuana in San Francisco, California. Don Duncan says he is not a pot smoker. "I haven't in eight or nine years now," says Duncan, 37. "It wasn't the right thing for me." Which is ironic, since he spends most of his day around plenty of cannabis as part owner of a West Hollywood, Calif. dispensary of medical marijuana, a storefront operation where as many as 100 customers  Duncan is careful to call them patients  line up daily with letters from their doctors to procure products with names like L.A. Confidential and Purple Urkel. Lately, however, Duncan directed more energy toward his role as California director of Americans for Safe Access, a group of merchants, doctors and patients that aims to make it easier to dispense and obtain marijuana for medical purposes. The organization's central mission: fighting U.S. Drug Enforcement Administration raids on dispensaries. California is the largest of 12 states allowing marijuana for certain medical uses, but the federal government considers all marijuana illegal. The conflicting statutes have led to an uncomfortable existence for California's growing ranks of marijuana providers. "At any moment, the DEA can come kicking down the door," says Duncan. That is just what happened on May 27 to Virgil Edward Grant III, 41, owner of six L.A.-area dispensaries. Grant and his wife Psyhra Monique Grant, 33, were charged with 41 counts, including, drug conspiracy and money laundering and aiding and abetting the distribution of marijuana near a school. Grant pleaded not guilty on June 2. An employee, Stanley Jerome Cole, 39, pleaded not guilty to charges of selling a pound of marijuana to an undercover agent from the back door of one dispensary. Timothy J. Landrum, special agent in charge of the DEA in Los Angeles, called the suspects "nothing more than drug traffickers." Prosecutors say Cole sold marijuana to a motorist charged with gross vehicular manslaughter in connection with a December accident near Ventura, Calif. His truck hit a parked car on a highway shoulder, killing the driver and seriously injuring a California Highway Patrol officer. Police said the driver was under the influence of marijuana that he said he had purchased at a dispensary in Compton, where one of Grant's operations is located. Even before the Grants' arrest, Duncan's group had stepped up its efforts to fight the DEA, securing letters from six California mayors to U.S. Rep. John Conyers, a Democrat from Michigan who is chair of the House Judiciary Committee, requesting that the DEA halt the raids. In an April letter, Conyers asked the DEA to explain its use of "paramilitary-style enforcement raids" against medical marijuana patients and suppliers in California. Duncan's group also backs a California state senate bill that would callon the federal government to respect the state's marijuana laws. In fact, the day the Grants were arrested, Duncan was at L.A.'s city hall with a group of protesters delivering a petition to enlist the help of Mayor Antonio Villaraigosa (who has not taken a position on the issue). When they learned that DEA agents were at one of Grant's dispensaries, just a few blocks away, the group quickly moved to the dispensary, surrounding its entrance while the DEA agents were still inside. The bust proceeded as Los Angeles Police Department officers stood by, but also not interfering with the peaceful rally. Duncan has been an activist for more than a decade, starting out by helping to gather signatures for the 1996 initiative that legalized marijuana for medical purposes. At first skeptical, the Texas-born son of a physician and a nurse was moved by meeting a Berkeley schoolteacher who used marijuana to cope with the pain of glaucoma. "I thought, 'this isn't somebody wanting to get high  this is real,'" recalls Duncan. "I want to help." Four years ago, he moved to Los Angeles, helping to open a dispensary and working to recruit activists and local politicians to the cause. Now he does that from a small office just upstairs from his four-room dispensary, which sits next to a Tattoo parlor and around the corner from a Target store. Two beefy security guards watch the door and a smiling receptionist sits next to a case displaying bongs and other paraphernalia. Inside, patients examine samples in glass cases. Some day, Duncan says, this will be as normal as visiting Walgreens. For now, he's less focused on his inventory than on his group's efforts to supply activists with "raid kits"  protest signs, bullhorns, and sunscreen  so they can show up on a moment's notice to confront DEA agents. Says Duncan: "I predict we're going to have a very long summer."